Hi TL, I am Flume, and I have been compiling much data strictly for FPL. I am here to write a comprehensive guide on how to succeed in FPL. This guide will act as a supplement to the Pangpootata’s guide, http://www.teamliquid.net/blogs/448172-guide-how-to-fpl. How you want to construct a Main and Anti team can be found there. What I am providing here is what I believe is also important to FPL in addition to what Pangpootata wrote. 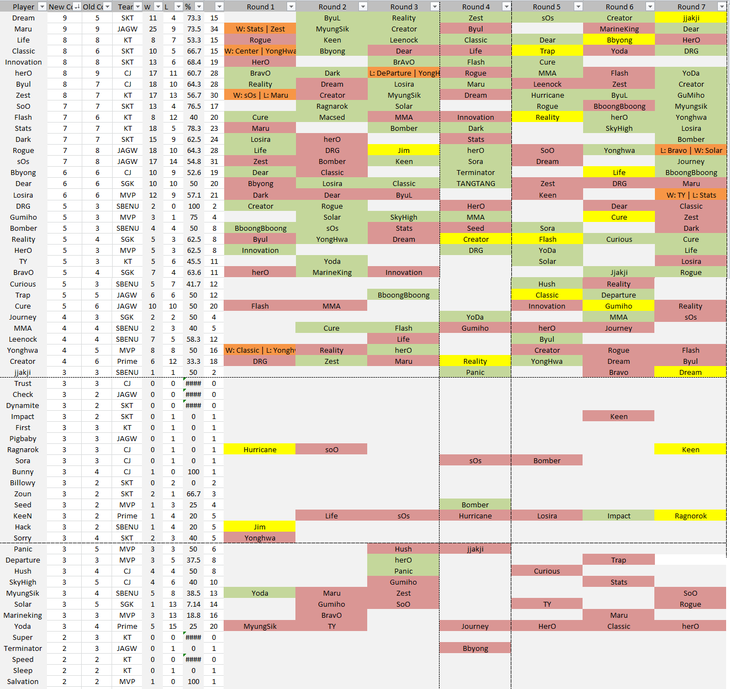 The thread will have an analysis of each team, which picks are best in Fantasy Proleague Round 4, data from Round 3, and more stray observations. I am not right on every topic. I will make wrong picks. Feel free to point something out or debate with me on something and I will respond. The most important thing I want to provide is my data from Round 3. I strongly recommend going on imgur to look at the charts I have in the post. Round 2 is on excel. If anyone really wants it, feel free to PM me. who is on SBENU may not be better than BravO who is on Samsung Galaxy. When creating a team, it is important to identify who are the core members, the rotating members, and the bench members. By identifying which kind of player they are, we can compare their worth relative to their cost. SKT1 is the best team in Proleague because of their great depth. Dark, SoO, Dream, Classic, and Innovation could all be ace players for SKT1 because every one of them are good enough to win the GSL. Since 5 of their players are so good, each of them will get less playing time, and have a lower chance of getting a chance to play the Ace match. Players outside of Dream, Classic, Innovation, SoO, and Dark are often not good choices. CJ have 3 players that play almost every round: herO, ByuL, and Bbyong. Their fourth player is usually Hush or Skyhigh, but recently Coach Park has been rotating Sora and Ragnorok into the mix, leaving it hard for us to identify a clear 4th player. Hush serves as a PvP sniper, which should be very strong this round because Terraform is a protoss dominated map. ByuL and herO share the ace spot. At the moment, it looks like CJ may be the best choice for your main team. In Rounds 1 and 2, Samsung would heavily rotate players in and out. Players like Journey, eMotion, Guilty, Armani, Shine, and Hurricane would play 1-2 games. Looking at Round 3, it seems that Stork is opting to solidify his lineup. Dear, Reality, Solar, and BravO are the core 4, with Hurricane and Journey as the rotating 5th man. Only Dear and Solar have played the ace match so far. Jin Air shares the same problem with SKT1 but to a lesser degree. Outside of Maru, Rogue, sOs, Cure, and Trap, players will not see playing time. Trap is the rotating 5th man, but has played a fair share of ace matches, showing us that Jin Air is capable of playing 3-5 different players as their ace should Maru not be up for the job. Maru will also most likely come out as an ace against KT Rolster, since KT likes to sacrifice Zest. Creator is a maybe, but Prime seems to be unable to make players better. Until we see otherwise, anyone other than Creator seems to hold no promise. KT is notorious for playing the same 4 players every single round. After Life joined the team, TY’s playing time plummeted, but stayed as a rotating player. Life, Zest, Flash, and Stats are so expensive because they are played every single time. First, Super, Speed, and Sleep have only played 2 times in Proleague. Life, Zest, and Stats are the usual ace players, but Zest usually takes the spot. MVP used to send MarineKing out every time until they finally realized that he wasn’t winning games. MVP still has the dynamic duo of Losira and Yonghwa and whoever Choya feels like as ace players. The large amount of players on MVP spreads out the playing time a lot, so outside of Gumiho, Losira, and Yonghwa, there isn’t a clear 4th man. While HerO has been playing more, he is still a mercenary. I'll put HerO as a core member for now. SBENU is similar to Samsung and MVP in that their lineup is spread out. SBENU has not played a single ace match yet, so we don’t know who the ace player is, but that might not even matter. SBENU’s lineup is deep enough that we likely wouldn’t know who the ace is regardless of history. Choosing a player from SBENU is risky because of the small amount of games played, depth, and newness of the team. On average, players costing 7+ will be in the lineup almost every week, with a medium to high probability for becoming the ace player. Players costing 5-6 should be on the lineup 5+ times, with a small probability as the ace player. Players costing 3-4 should be rotational players, and anything under are rarely played. Players that do exceptionally poorly break this benchmark. I always thought that 9+ pointed players are never worth investing in. One of the rare exceptions of this was when herO went ahead and won almost every single game back in Round 2, but the chances of that happening are near null. Between Dream and Maru, Maru is the much better choice. He has been performing well for a longer period of time than Dream, and Dream never played an Ace match in Round 3. Plus, Dream is in SKT1 which means he’ll likely be rotated in and out of the lineups. He isn’t even in the starting lineup for Round 1. Both herO and Byul are evenly matched. They are most likely going to be fielded as the ace player (unless Bbyong suddenly makes a rise) and are very skilled players with few weak matchups. The two KT players share Ace duties between Life, Zest, and Stats, and haven’t been performing top-notch lately, with ~55% win rates in Proleauge. Zest has a really bad matchup against Terran, which makes him risky to snipe. Zest is also unplayable against Jin Air as an ace, which is why I would give Life the slight edge. The problems with Classic and Innovation is that they both are on SKT1. Both of them will be sharing Ace Game duties between 3+ other players because of the depth of the SKT1 lineup. For an 8 Point player, you want a player who will be on the lineup on almost every round, but Classic doesn’t even start on the first match. Innovation only played on 5 out of 7 Weeks last round, and to the best of my knowledge, has never played in an Ace match. Both are very strong players, but are risky choices in FPL. Stats and Flash are in KT, which means that they will probably be played every single round because its KT. Stats actually boasts a 78.3% win rate, but he was only played 5 out of the 7 weeks last round. I originally had Flash as an “average,” but good results in individual leagues and being placed 7 out of 7 weeks last round puts him up a notch. Stats will probably have higher Ace priority, but if Flash continues to do well he can start playing Ace matches too. SoO went 5 for 5 last round in Proleague, started the 2nd most out of SKT1 last round, and won Kespa Cup. SoO is clearly showing a very high caliber of skill with a 76.5% win rate in Proleague. I’m optimistic that SoO is the best choice out of the seven pointers if I had more faith that SKT1 would send him out more often. Dark would go up a tier or two if he didn’t have such an awful Round 3. He was played 4 out of 7 weeks, and only won two of them, although the quality of his opponents was quite tough. Dark is a risky pick this time around. I might be too optimistic by putting him on average tier. Surprisingly, Rogue was on the lineup all 7 weeks last round even though he’s on a deep team like Jin Air. With a 4-3 record, he is a pretty good pick and has Ace standing. He however, doesn’t start this week which is concerning. sOs is one of the more inconsistent players, and shares Ace duties with Rogue and Maru. He has a mediocre 54.8% win rate in Proleague and went 3-3 last Round. Jin Air does show faith in his skill by sending him out almost every week, but his win rate has not been the best. Dear is the best player on Samsung Galaxy, and only shares ace duties with Solar. One of Samsung’s traits is that they keep rotating the lineup, but Dear (and Reality) played all 7 weeks last Round, and has the most played games out of anyone else on the team. What’s holding him back is his mediocre 50% win rate. He beat Losira, Classic, and TANGTANG, but lost to Zest, DRG, Maru, and Bbyong last round. If Dear starts drawing easier opponents, he should be raking in more points. On the other hand, Bbyong was played 5 times last round, beating Dear, Terminator, and BboongBboong. He lost to Classic and didn’t have the chance to play against Life. His good win rate against good opponents combined with his high lineup appearance makes him a solid choice. I believe that CJ this round will begin using a more rigid lineup than last round, giving Bbyong more playing time. Losira is one of the main Ace players for MVP, and performed very well in week 2(?). However, his week 3 appearance was absolutely horrible, going 1-5. If Losira didn’t manage to lose almost every game, he would be a higher tier. Reality, like Dear, was sent out every single week in Round 3, going 3-2. If we see this much confidence from Samsung, he could be one of the ace players for Samsung. Bomber was sent out 6 times last round, and SBENU sent out 8 different players. Aside from HerO, all four are all sent out equally often, have similar win rates, and are pretty good players. Take your pick. Before this round, Cure had a 62.5% win rate in Proleague. He was a reliable player for Jin Air, Cure then proceeded to play 4 terran players in Round 3, and lost to 4 terran players. If Cure manages to play a non-terran, I think he could be a good pick. just won Dreamhack, but DRG, Bomber, MMA, Jjakji, MyungSik played more than him last round, and they’re all on SBENU. Curious only won 1 time last round. Yonghwa is one of the ace players of MVP, with 7 appearances in 7 weeks, and a 50% win rate. One of the reasons why Yonghwa is so cheap is because he went 2-5 last round, but I believe Yonghwa is still a very strong 4 pick. YongHwa doesn’t start in the first round, so it may be wise to trade him for later. Creator was played all 7 weeks which is very good for a 4 pointer, but he’s on Prime. You never really want someone on Prime. MMA is on SBENU, which means his playing time is limited and he doesn’t start this week. He went 2-3 last round, beating Cure and Flash while losing to Journey, herO, and Gumiho. MMA is probably a better pick if you want someone from SBENU since he's a point less, but he doesn't start this week. Leenock and Journey was sent out 2 and 3 times respectively. Leenock is a good player, but he is a mercenary and is on SBENU. Journey played 3 times last Round, and has only appeared 4 times in Proleague. He’s too risky of a pick since it seems he won’t get playing time. There are twenty four 3 pointers. This is what the 3 pointers look like on a chart. Out of all the 3 pointers, they only have 6 wins combined. Sorry, Keen, Yoda, Check, Panic, Departure, Jjakji, Trust start this week. Hush, SkyHigh, Panic, DeParture, Seed, and Ragnorok, Myungsik, and Solar are consistently rated into the lineup occasionally. I think MyuNgSiK has the highest potential for value, but it’s hard to judge. Hurricane is undervalued here. He doesn’t start this week, but he was sent out 3 times last round. He can be a safety trade in case one of your starters goes wrong. 1. Be sure to check the strong/weak matchups of each player. Cure vs Trust may seem like a favorable win for Cure, but further research may say otherwise. Cure vs SoO may be closer than you think. 2. Map balance play a role in predicting who will be sent out, and who will win. Think about why a certain player was sent out on that particular map. 3. Terraform will likely be riddled with PvPs and/or Protoss snipers. 4. Points are heavily inflated for players who did well in individual leagues to the point where they are mostly not worth investing in. Curious, Classic, Dream are all examples of this. 6. If your player does not start the first week, it is advisable that you don't choose him the first week, but trade for him later. Look at the lineups each week! Choosing your team based on the starting lineups can and will override the player picks I wrote above. Usually xpaperclip posts the lineup every Friday. 2. Foreign tournaments (this is meta-FPL). If you have the time, you might want to research on all the foreign tournaments that will be happening during FPL playdays, and which players will be going. FPL is not only about player strength, but also about player availability. This will affect picking and trading decisions. 3. Round-specific picking strategy. This round, I find that TL admins have set quite high points for all the good players, as opposed to last round which was cheaper. Might be better to pick ~2 high pointers with the rest being 3-4 pointers that get rotated, and have to be traded in and out. 4. Week 1 matchups! It’s important to pick players who have favourable matchups at the start, so they will get points, appreciate in value, and be worthier than their original costs. E.g. Sorry vs Keen, Departure vs jjakji are matches that a 3-pointer will win, as opposed to say herO vs Flash where a high pointer is going to lose. 5).Aligulac might be useful in predicting outcomes of individual matchups if you’re unsure of the players, although it’s not totally trustworthy. I hope you found the data/guide useful. I will answer questions/comments, and am willing to give my input on your team if you so desire. I’ve finished sub 100 several times, but have also done relatively poorly in the past. (Don’t trade like me) Hopefully you can use the data better than I can. Big thank you to Pangpootata for providing thoughts and for writing a great guide. Thanks for the kind words I spent a lot of time on it. Wow this is really good stuff. Well done! This is very impressive! I knew I should have picked Yonghwa over Leenock, but I was blinded by the week 1 rosters. Well, I guess we'll see. Thanks for your hard work! Regarding 9-pointers, I quite agree that they should never be picked -- and wasn't CJ herO worth only $7 in round 2? That reinforces the argument even further.